Dell Inspiron 5040 laptop review - today we are going to take a closer look at one of the cheap Dell Inspiron laptops. Dell Inspiron 5040 is a 15.6-inch laptop that is perfect for home users, students but not so much as a mobile business computing device. It works best as a replacement laptop. 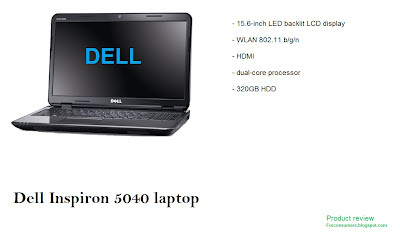 Dell Insprion 5040 laptop has a nice 15.6-inch LED backlit LCD display with good contrast and viewing angles. The cheapest versions of the Dell Inspiron 5040 laptop come with AMD E-Series dual-core processors rated from 1.6GHz and above. The space for storage is 320GB but there are models that come with bigger HDD. Connectivity options for Dell Inspiron 5040 laptop include WLAN 802.11 b/g/n, HDMI, 3x USB ports. Dell Inspiron 5040 has a built-in camera and microphone for video calls and other apps. The sound is provided by two loud stereo speakers (the sound quality could be better though). Dell Insprion 5040 laptop weighs around 2.40kg . The price - prices for the Inspiron 5040 laptop start at around 260 and can top 400 for the highest specs models.